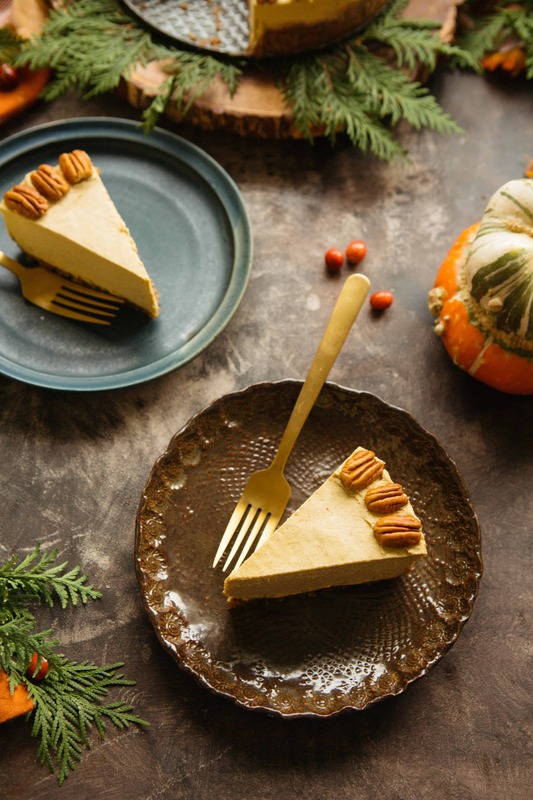 This silky smooth Pumpkin Cheesecake is raw, vegan, gluten free, and Paleo, but you’d never know it. As someone who staunchly considers themselves to be an omnivore and an equal-opportunity eater, I’ve always rejected the idea of dietary extremes and exclusions based in pseudoscience and trendiness. With that said, I do sometimes like to dabble in the realm of veganism. Never with the intention of voiding myself of all animal products, but simply because vegan food can actually be quite delicious. My rule of thumb when cooking this way is that the recipes must taste good on their own, without the need for substitutions. You can scour my website to find tons of recipes that happen to be vegan just because they are, not because they’re trying to be. What I mean by this is that I’m not a fan of foods that claim to be vegan versions of something that is not. Think cheese, butter, mayonnaise, and let’s not even start with the meat alternatives. Tofurky? Barf. And for the last time, stop spreading the rumor that nutritional yeast tastes just like parmesan cheese. It does not. So when my dear friend Nina came to town this past week and invited us to a very vegan PLANT BASED dinner, I decided to try my hand at making a raw, vegan cheesecake. Why? Mostly because I was intrigued. The very idea of a vegan cheesecake goes against everything I believe, but it piqued my curiosity. I wasn’t really buying it, but I had to know for sure. I set out to make a chocolate version, and after viewing many, many recipes, I decided to just wing it with what I had in my pantry. I was skeptical and my expectations were low. It might taste okay. It might even taste amazing! But there’s no way in hell it’s going to taste like an actual cheesecake. But, you guys, I was wrong. I was so, so wrong. That night, after a surprisingly satisfying vegan dinner and several glasses of wine, we sliced into that bad boy. I dished out pieces to everyone in the group, and quickly started hearing ooh’s and ahh’s and mmm’s. Still not convinced, I finally took a bite for myself. And let me tell you, my jaw almost hit the floor. Not only was it good, it was really good, and it tasted damn close – shockingly, perplexingly close – to the real thing. The texture was spot on. Smooth and creamy, light but dense. It didn’t taste at all like cashews. It was chocolatey and tangy and just sweet enough. I was a believer, and I immediately wanted to make another. So that’s exactly what I did. 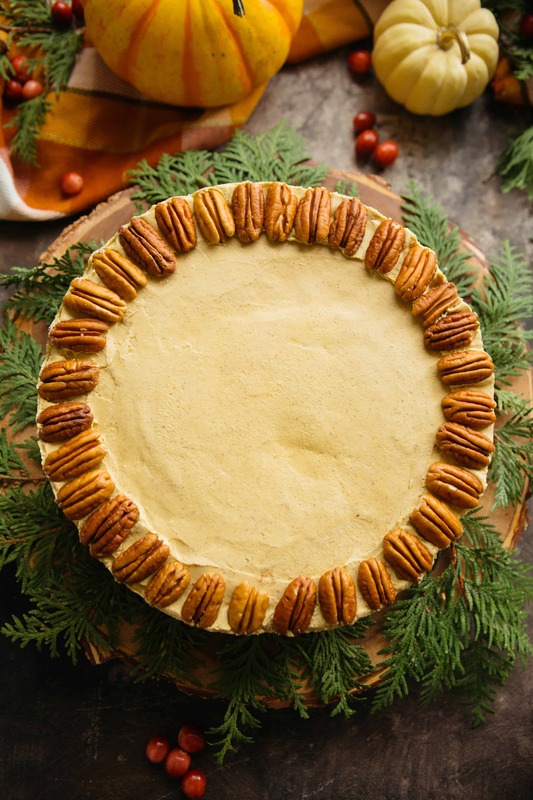 only this time around I made a pumpkin cheesecake, because, you know… fall, Thanksgiving, etc. As luck would have it, it turned out just as good as the chocolate one. Even Chaser, the most dairy-obsessed person I know, agreed. I’m still trying to wrap my head around the whole thing. Make no mistake that a vegan cheesecake is still, in fact, dessert. It is certainly not to be confused with diet food. But is it better for you than a traditional cheesecake? Absolutely. While it is calorically dense, it’s also made entirely from whole foods so it boasts a pretty healthy nutritional profile. Did I mention it’s also raw, Paleo, and totally gluten free? I don’t even know what else I can say to sell you on it. Oh! I know. 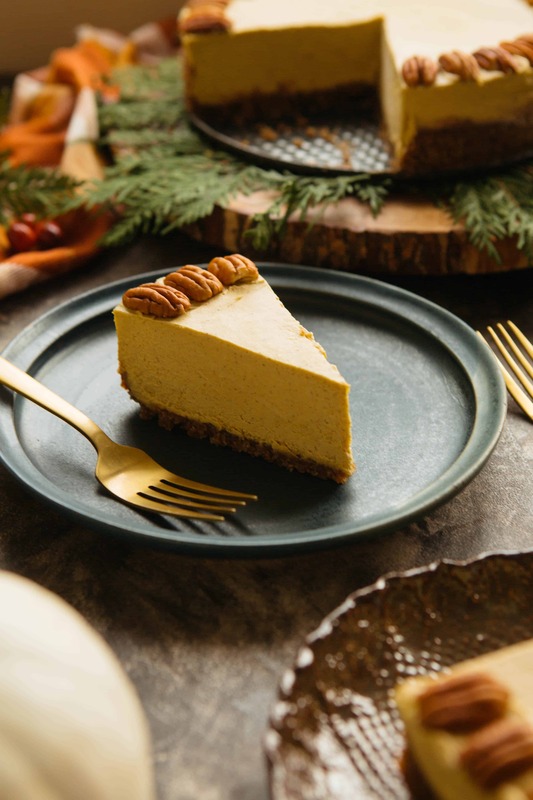 How about the fact that it’s no-bake and actually easier to make – by a long shot – than traditional cheesecake, and for that matter, any pie, cookie or cake you can think of. It’s the truth, and I’m confident that one bite will make you a believer. Spray a 9-inch springform pan with non-stick spray. Add pecans, dates, salt, cinnamon, and ginger to the bowl of a food processor, then process for a few minutes until it starts to stick together. It should be mostly blended, but some small chunks are okay. Pour into the pan, then press into the bottom and about 2-inches up the sides. Use a flat-bottomed glass to press until even and firm. Refrigerate. Add the cashews, pumpkin puree, coconut milk or cream, raw cane sugar, maple syrup, coconut oil, lemon juice, salt, vanilla, cinnamon, ginger, clove, and nutmeg to a high-powered blender. Blend on high until the mixture is ultra-smooth. This may take several minutes and you may need to stop a few times to scrape down the sides and help move the top contents down to the bottom with a spatula. Be patient and run the blender as long as you have to to get it as smooth as possible so there is no remaining grittiness. Achieving this texture is very important. Pour the batter over the crust and smooth out the top. Refrigerate for at least 6 hours (overnight is best). 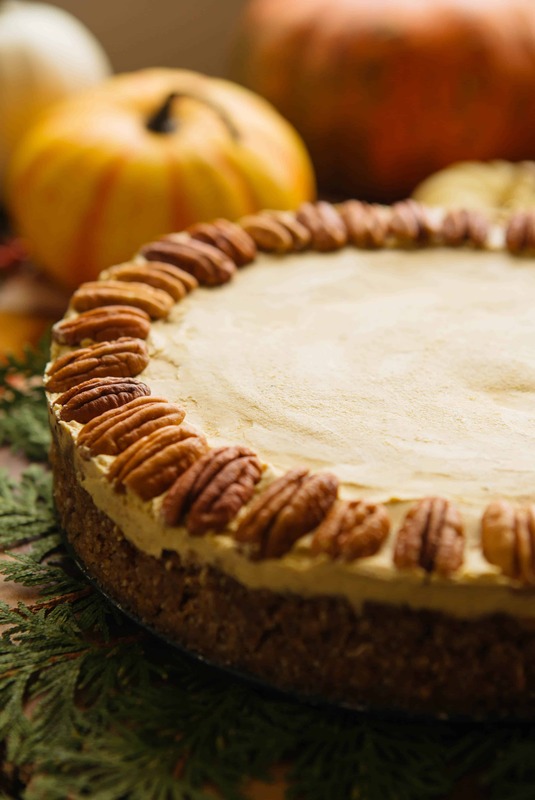 Arrange pecan halves around the perimeter of the cake to garnish if desired. Ha! Raw vegan cheesecake does not scream Coley, but I have no doubt it’s good. I saw the Insta story of that chocolate version and everyone looked totally blissed out on it. Not just the wine. It’s kind of become my obsession. Just too good not to share! Working on getting that chocolate recipe up in time for valentines day! 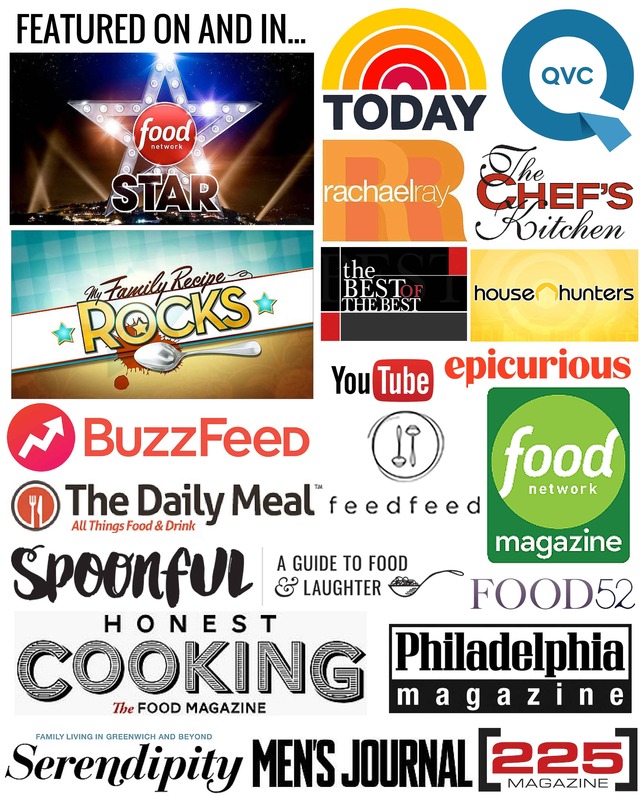 I definitely agree with you, I have a tendency to just scroll past all those Raw, Vegan, Paleo etc. recipes, because I think they just can’t be as good as the real deal. But somehow, I couldn’t scroll past this, it actually looks really good. thank you so much! I swear, I’m a total believer in the vegan cheesecakes. They are seriously so good! Two questions: 1) How long does it need to be out of the refrigerator before serving? 2) How long does it last at room temperature? Hi Monika and I am SO SORRY for not getting back to this in time. Just found it in my spam folder! To answer your questions, it’s best served cold right out of the refrigerator. I’m not sure exactly how long it will be good at room temperature, but it holds it’s shape and texture fairly well so it won’t fall apart like soup. Please report back if you made it! I don’t follow a vegan diet by any means but totally agree that cashew cream is like a delicious miracle! 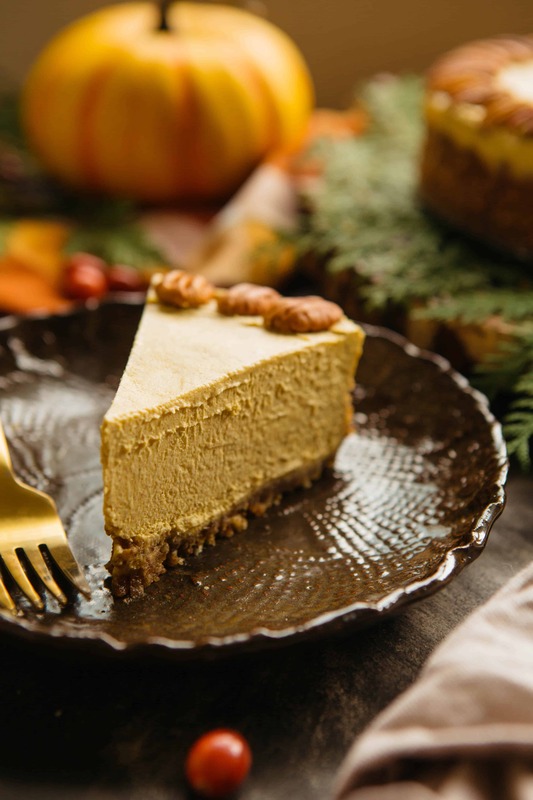 I make a frozen peanut butter pie with a vanilla and cashew base that my kids go crazy for. 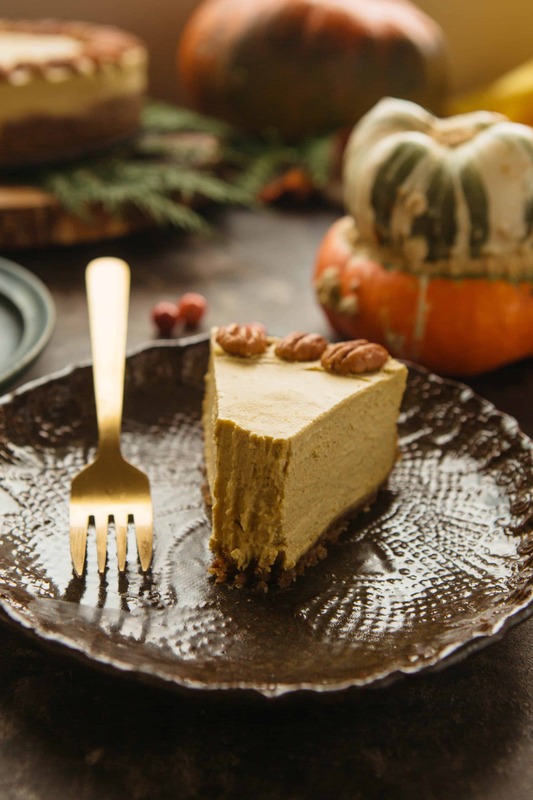 I’ sure this pumpkin cheesecake will knock them out! So pretty too. So true! I’ve been beyond impressed with a lot of vegan desserts. Such a great alternative! Hey Shannon! You can try, but be careful because changing to a liquid sugar could make the mixture too loose and prevent it from firming up in the fridge. Also, maple syrup is sweeter than sugar, so you’ll want to add a bit less. For a little extra insurance, maybe add an additional tablespoon for coconut oil to help ensure it gets nice and firm. Using coconut cream instead of coconut milk will help too, and make sure you cashews are very well drained and dry! Let me know how it works out! I tried your recipe and it was a complete success among my vegan and non vegan friends! Thankyou so much for sharing. I was wondering if there is an alternative for the cashew nuts, another nut for instance? Thanks Julie! So glad it was a hit! 😀 As far as I know, cashews are the only nut that will produce this super smooth and creamy texture with a mild flavor. Peanuts would give a similar texture, but they obviously have quite a bit of flavor. Hope this helps!